These days, it seems like you can get craft beer from pretty much anywhere. Now that craft beer is its segment of the tourism industry and every store from Whole Foods to your local bodega has at least a few local beers, it’s easier than ever before to find something worthwhile to drink pretty much anywhere. Aboard a cruise ship, for instance. 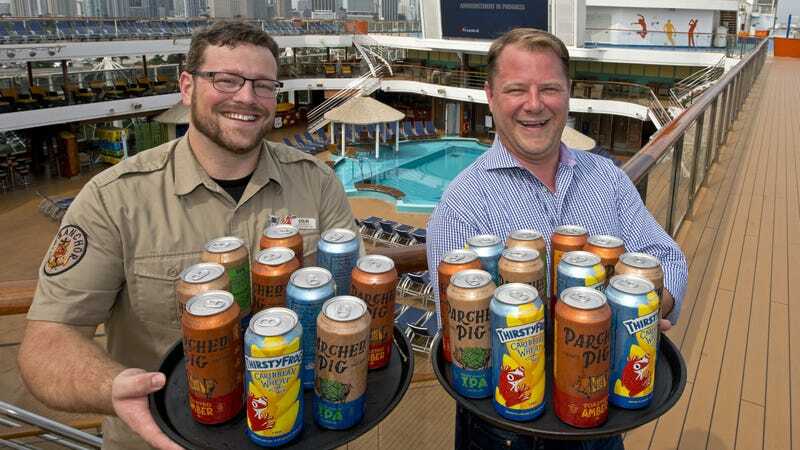 Carnival Cruise Line has announced that the luxury vacation ship imprint will now be canning and kegging three beers brewed aboard the Carnival Horizon and Carnival Vista, for purchase on all 26 of Carnival’s current ships and at select travel destinations. The company’s two pre-existing shipboard breweries (the Vista has been brewing at sea since 2016) will be distributing the beers through a partnership with Lakeland, Florida company Brew Hub. Whether sailing the high seas or sitting in an appropriately low chair, it’s heartening to be reminded time and again that beer can and should belong to everybody.